Santa Rosa plum remains one of the most popular plum trees in the United States with more than 30 percent of the country’s total plum crop coming from this tree. Santa Rosa plums fall into the Japanese plum species, tending to be larger, rounder and firmer than fruit from European plum species. While most plum trees require cross-pollination from another nearby plum tree, Santa Rosa is self-fertile, making it a great choice for gardens with limited space. Japanese plum trees originated in China before being introduced to Japan, where they thrived and began to play an important role in Japanese culture. Plum trees were introduced into the United States in the mid-1700s. But it wasn’t until the father of modern plum cultivation, Luther Burbank, imported plum seedling in the late 1800s that the trees became popular. Burbank made dozens of new, more stable varieties of plum trees, including the Santa Rosa plum, which he named in honor of his Santa Rosa, California, garden. Santa Rosa plum trees grow up to 25 feet tall. As a self-pollinating tree, Santa Rosa does not require another nearby plum tree to set fruit. In the spring, fragrant white blossoms cover the tree, followed by narrow green foliage. In mid to late summer, 2- or 3-inch dark red to purple fruits with sweet red flesh mature, ready for harvesting. 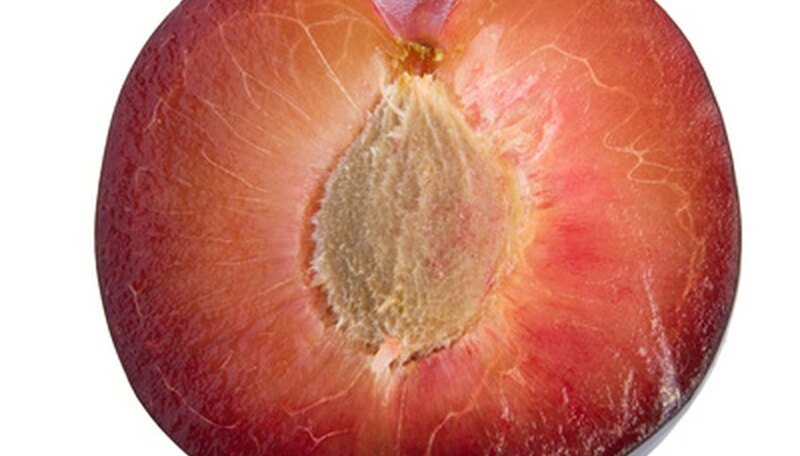 An older cultivar, Santa Rosa plum remains highly susceptible to plum leaf scald and several other bacterial-related diseases. Plum leaf scald eventually kills the tree while disease such as bacterial spot cause cankers on the tree’s trunk and limbs, giving it a knobby, unattractive appearance. Unfortunately, the best way to avoid these problems means not planting Santa Rosa plum trees at all. Instead, gardeners should use bacterial spot-resistant cultivars. While Santa Rosa plums grow in almost any type of soil, they thrive in full sun in well-drained soil. The tree is sensitive to late-spring frosts. Planting the tree on a mound away from buildings helps protect the tree from pockets of freezing air that might harm the blossom and affect crop production. The tree requires pruning during the first year to form the shape of the tree. In subsequent years, pruning is also required to encourage outward growth of the branches so they produce more fruit. Santa Rosa plums taste delicious plucked and eaten right off the tree. These sweet, juicy fruits also work well in jams, jellies and sauces. While most Japanese plums do not make good dried fruit due to their low sugar content, Santa Rosa plums make tasty dried fruit.